On every mountain trail we climb, at each monastery we visit, we hear two monks' names: Master Xuyun, and Master Hsuan Hua. Of course Master Hsuan Hua is the reason we are visiting Buddhist Monasteries in the first place. He is the founder of our Buddhist association, and the monk who brought the Dharma to the West. But his Dharma-transmitter, the 120 year-old Great Master, our grand-teacher, Master Xuyun, (Empty Cloud) is the monk from whom all Chan teachings flow in China for the last century. For the last two days we have stayed at Zhenru Monastery on Yunju (Cloud Dwelling) Mountain in Jiangxi Province. Master Xuyun was both frugal and tough. For years I had heard that at age 118 (!) he still preferred to live in a cowshed at Zhenru Monastery rather than move into the more comfortable quarters of the Monastery. Before Master Hsuan Hua entered Nirvana he passed along a few photographs of Master Xuyun, one of which was the elder monk sitting in front of his cell in the cowshed building. The cowshed at some point fell down but its location was memorialized with a Master Xuyun Memorial Hall. Our delegation made a pilgrimage to that spot and here is a photo. A more detailed report will follow. 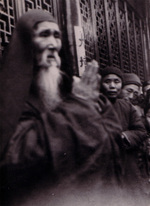 Master Qunwen, Abbot of Zhenru Monastery, is standing in grey robes in the middle. No toilet or water tap. Floor boards form a gap. Where is a monkey's mind? Both are licking you now. Tell me why to bother. Love of country? Love of nation? Is it a self indulgent task? Orange moon, so sad, so soon. Was it raining or snowing when they took the picture of you and the assembly in front of the memorial? Is it cold there? I hope you are getting enough to eat. Is the doggie a dharma protector? I woke up this morning wondering why he lived in a cowshed. Do you think it had anything to do with avoiding drama? Do you think Bodhisattvas avoid drama or thrive on it? I remember the saying that Bodhisattvas fear creating karma... so maybe that's why they live like hermits in cowsheds. But like Guan Yin is always reaching into the muck, so you think she would live in a cowshed??? and what about Di Dzang Pu Sa??? poor guy... talk about some drama. I really wish I could cultivate so I could save him from staying in hell for all eternity... it's mean to make him stay there i think. So we should all be nice and take up our personal cross and cultivate. I need some more coffee and I am going to do some homework too. It is really awesome to observe this picture of Master Xuyun!! A monk with long hair and beard. I guess he is out of the ordinary. cloth covering he was wearing. Rare it is to find a great enlightened master like him. Namo Amitabha!